Woods out of a greenside bunker to 2 ft.
Francisco Molinari claimed the Open Championship and became the first Italian golfer to win a major championship. His mentor, Constantino Rocca, lost a playoff in 1995 to John Daly at St. Andrews. Rocca got into the playoff by holing an incredible birdie putt from the Valley of Sin at St. Andrews to get into the playoff. Molinari’s victory was spectacular in a sense that he didn’t make a mistake the entire day. He shot 69 with 2 birdies and no bogeys while the competitors flimmed and flammed all day with all different types of adventures. Molinari was playing with Tiger Woods and while I don’t have any facts here, it seemed to me that Molinari’s TV time was far less than Woods and less than many of the competitors. He was simply boring as he continued to stripe drives into the fairway, hit irons on the green in regulation, and hole putt after putt from 4-6 feet to save par. He finally made his first birdie on the easiest hole on the course-the par 5 14th hole. His biggest scramble was the par 5 6th where he actually made a double-sandy par. 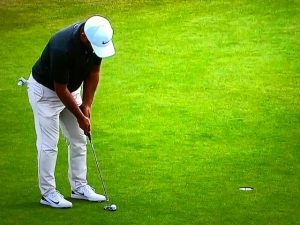 Molinari’s putter bested the field which seemed to all fall by the wayside with a series of unforced errors. His drive on 18 was perfect and he converted his 103 yard pitch into a loud birdie to finish at 8 under. No one would challenge this number coming in. The day began with 3 players, Speith, Kinser, and Schauffele all at 9 under and all of them would surrender that lead on the front 9. Speith was many fans’ favorite to win but the magic of the first 3 days disappeared in the final round. The putting woes that had plagued him this year to date returned and couldn’t bail him out of some missed shots along the way. He would go on to shoot 76 and finish in a tie for 9th incredibly with the man whom he bested at last year’s Open Championship-Matt Kuchar. Kinser sort of imploded with putting woes as well and a double bogey on the 11th after some fairway bunker adventures. Kinser shot 40 on the front nine and struggled to a 4 over 74. He displayed a lot of grit and determination on the back nine. Schauffele had the best chance and was tied for the lead through the 16th hole but bogeyed the 17th hole. Schauffele lost his approach shot to the right rough on the 17th and after a long time of dealing with the gallery, his approach landed 20 feet away but he couldn’t convert the par putt. 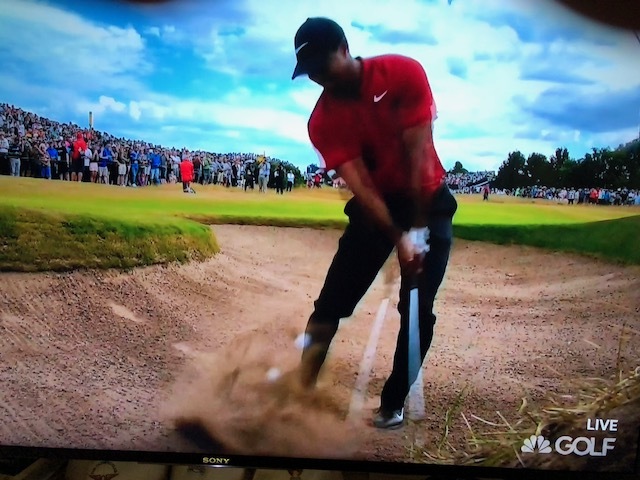 Tiger Woods played as flawlessly as Molinari on the front nine besting him with 2 birdies and found himself on top of the leaderboard on the 11th hole. 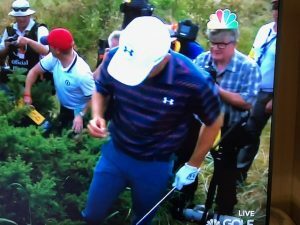 The 11th would be his undoing where he decided to hit a flop shot to try to save par and ended up missing the shot and just like that–double bogey 6 and off the leaderboard. He followed up with another bogey on 12. A birdie on 14 would close out his day but he was there all day. He played a terrific round and made two more mistakes than Molinari (who made none) and that was the tournament. 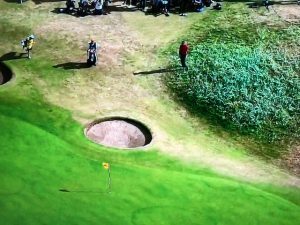 A number of years ago, this round would have resulted in victory as the intimidation factor against the field would usually kick in. That intimidation factor no longer exists as an advantage for Woods–he knows he will have to beat these guys who no longer fear his presence. Conditions at Carnoustie were difficult as the wind blew all day with gusts up to 25 mpg. It seemed that the wind was with on the 18th as the words “Barry Burn” were not uttered all day long. This event was one of the few times that the burn was not a factor in the outcome of the tournament. With no rain, the fairways remained fiery especially on the back nine. It was interesting to see the players hitting 5 irons to the first green whereas on Saturday, most approach shots were 100 yards or less. I have to plug NBC for their fine coverage of the event with the likes of Dan Hicks, Johnny Miller, Gary Koch and Roger Maltbie providing excellent commentary. Thank God-that Fox doesn’t have the rights to this event and hopefully the R&A will never allow it.